If it is more convenient for you, you can rename the captions. Select Caption > Rename Caption and then select the caption to rename from the list. In the caption to rename, click the Caption Menu button and select Rename Caption. 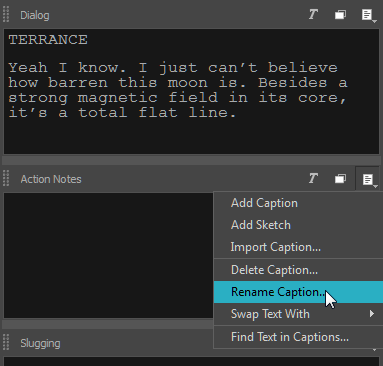 NOTE: After you have changed the names of the captions and you are certain you want to keep these names throughout the project, you can set the new names as the default by selecting Caption > Save Captions Layout as Default.